Hello Stampin' friends! I made a card yesterday for Hannah's 17th B-day...which is today and I still can't believe she is 17 years old...where has the time gone? !....Well, I think getting inky yesterday sparked up my crafty spirit or magically rekindled my absent mojo. So, I headed back down to my craft-room this afternoon on a mission to make a card for the SPD - Mix It Up # 5 Challenge (LOVE the concept of this FUN challenge) with this sweet SugarPea Designs Whisky Business Stamp set...ADORE her to bits! I took inspiration from both the sketch and the from some of the beautiful and vibrant colours in the yummy inspirational photo! 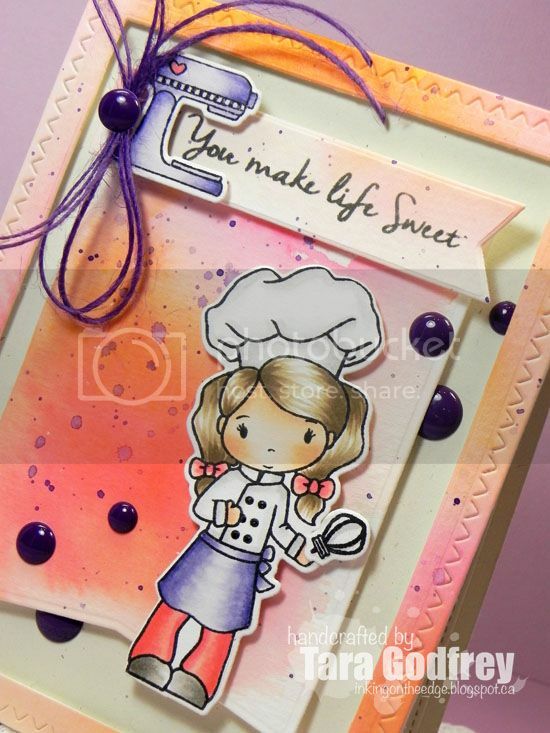 I started off by making some watercolored paper with my Peerless Water Colors inspired by some of the yummy colours from the Mix it Up inspirational photo. While, my water colour paper was drying I coloured up the Whisky Business girl, the KitchenAid stand-mixer, whisk attachment and the layered cake with my Copics and cut them out with the coordinating Whisky Business Sugar Cuts. I used the largest and second largest die from the Zig Zag Stitched Rectangles Sugar Cuts to create the frame and popped it up on the card with foam adhesive. I cut the fishtail banner from the Stitched Flags Sugar Cuts and stamped a sentiment from the Whisky Business Stamp set on water-coloured paper with a smaller stitched fishtail flag also from the Stitched Flags Sugar Cuts. I wrapped the stitched sentiment flag with purple AC Hemp Twine and popped up the adorable little stand-mixer. Finally, I sprinkled around some pretty purple YNS Gumdrops. And I finished off the inside of the card, as per usual, with a water coloured tag cut with the Gift Tag Sugar Cuts, stamped another sentiment from the set and then popped up the layered cake on the tag. 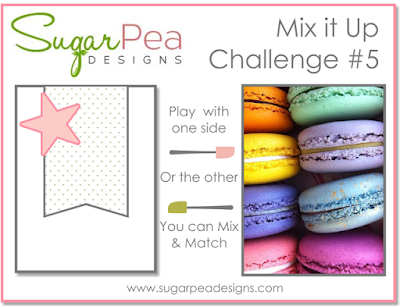 Thanks SO much for stopping by and havin' a little look at my Whisky Business card for the SugarPea Designs Mix It Up Challenge # 5! Your card is just so adorable!!!!! Love the colors! Thanks for joining us at SugarPea Designs! This is amazing, Tara! 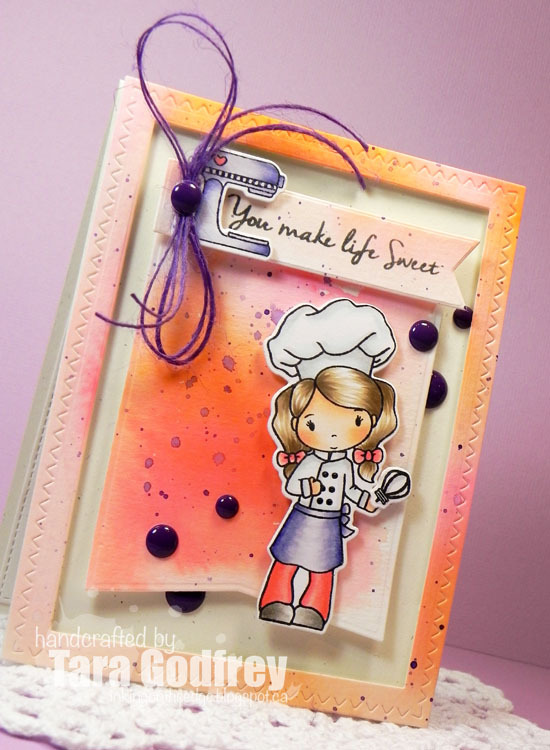 I love the warm colours and the cool background you created!